You might be surprised at how many small business owners don’t collect testimonials on a regular basis. When I ask clients for testimonials to put on their newsletter, brochure or website, there is often a big scramble to start gathering them. I was like that too, till my marketing guru Debi Hartlen MacDonald set me straight about it a few years ago. 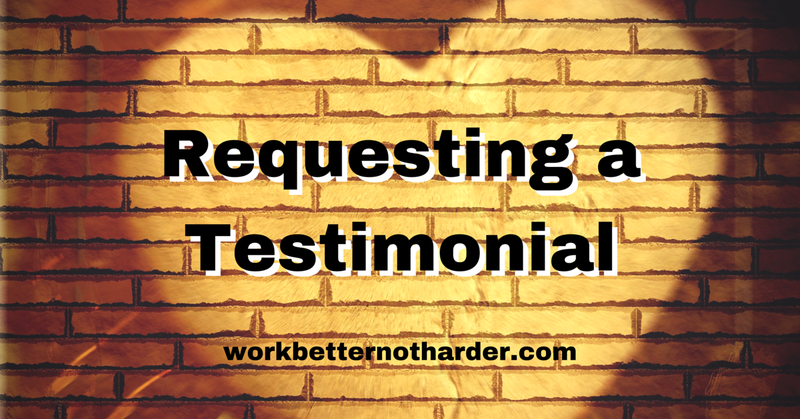 What do testimonials do for you? 2. Launch a project to collect testimonials from previous clients. Compile a list of your current and past clients. Identify the ones that you would like to have testimonials from. Don’t just include your ‘high ticket’ customers. Chose the ones you most enjoyed working with, the size of company that you prefer, the culture you felt comfortable with, etc. Testimonials are more effective when they're specific. Make it as easy as possible on your customer. Generate a list of questions that your customers can respond to. When formulating your questions, think measurable results. Don’t use questions that can be answered with a simple yes or no. Use your testimonials everywhere. Put at least one testimonial on every page of your website. Use them as headlines; use them in sidebars and footers. Use them in brochures, emails, and online profiles. One last point… you shouldn’t worry that you are ‘bothering’ your customers. If you have done a good job, your customers will be more than willing to sing your praises.